I went for a walk around central Wellington last night, something I often do to make my Fitbit pedometer register the 10,000 steps it recommends I take every day. The rain had stopped, but it was windy. As I walked down Willeston St. scraps of trash were blowing about. I passed a collection of plastic shopping bags, the contents of which were spewing out of one, about to take flight in the wind. It looked like a series of pictures – all of the same thing – a kiwi. I looked more closely. It turns out they weren’t pictures, but postcards – hundreds of them. They were postmarked September and October 2013. I call on you to withdraw your proposal for an open cast coal mine on the Denniston Plateau. Please let it remain the home of great spotted kiwi, the green gecko, ground weta, and giant snail. Denniston Plateau is an ecological and historic treasure, please don’t dig up the stunning 40 million year old limestone landscape. Your proposal to dig up coal will contribute to damaging climate change. The cards contained names, email addresses and in some cases mailing addresses of the people writing in. 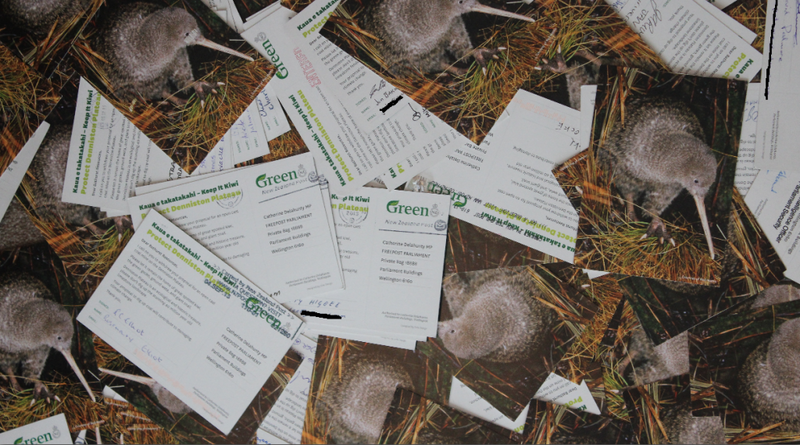 Would the Greens dump on the footpath, postcards from supporters voicing their opposition to mining on the Denniston Plateau? Unlikely. 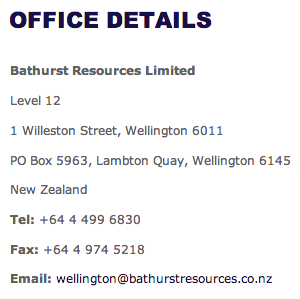 Their office is also on Garrett St. in Te Aro, so they weren’t mistakenly dumped with their trash. But you know whose office is based on Willeston St? Bathurst Resources. It looks like the mining company was doing a spring clean and all the postcards that were presumably presented to them by the Green Party, ended up on the footpath beneath their office. I’m sure a good number of the people who wrote in will draw a parallel between Bathurst’s careless littering and its plans to undertake open cast mining on Denniston Plateau. At the very least, Bathurst should have shredded the postcards containing all those personal contact details or put them in a proper council rubbish bag along with all the other junk they left on the footpath. Don’t worry Bathurst, I’ll shred them for you.